How do I like a reply in a course discussion as a student? You may be able to like discussion replies in your course. Note: The liking feature may be restricted to users with grading permissions (e.g. instructors and TAs). If you cannot like a discussion reply, this feature is not available to you. Click the title of the discussion. Locate the reply and click the Like icon. The Like icon will change color, indicating you have liked the reply . The Like icon also displays the total number of times a reply has been liked . 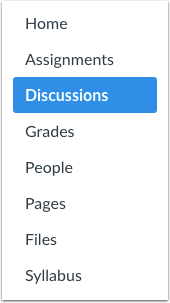 If your instructor has restricted the liking option to only users with grading permissions, you will not be able to see the Like icon or like your favorite replies. However, you can still see the total number of likes given to each reply. Previous Topic:How do I edit or delete discussion replies as a student? Next Topic:How do I use the ePortfolio Getting Started Wizard as a student? Table of Contents > Discussions > How do I like a reply in a course discussion as a student?